JUST one team remains undefeated in the South Australian National Football League (SANFL) Women’s competition after West Adelaide handed Glenelg its first loss of the 2019 season. 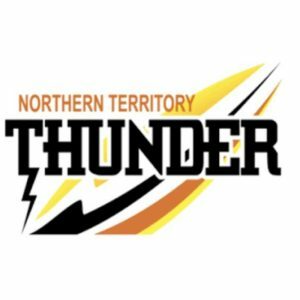 Norwood looks the team to beat after making it four consecutive wins with a victory over Woodville-West Torrens, while South Adelaide came from behind to knock off the Roosters, and Central District made it back-to-back victories with a win over Sturt. Norwood: Hannah Dunn, Monique Hollick, Jo Hill, Rosette Zerella, Zoe Greer. WWT Eagles: Sarah Perkins, Natasha Farrier. Norwood: Najwa Allen 29, Hannah Priest 22, Hannah Dunn 20, Rhiannon Busch, Monique Hollick 17, Sophie Armitstead, Elisha Gallagher 15. A four-goal first term from Norwood set up the ladder leaders for an impressive 28-point victory over Woodville-West Torrens Eagles. Monique Hollick and Rosette Zerella got on the board within two minutes of each other, before Hannah Dunn and Zoe Greer did the same a few minutes out from the first break as the Redlegs held the Eagles goalless in the first term. There was a goal drought from that point on however, with Norwood peppering the goals with six of the next seven scores – all of which were behinds, before Jo Hill finally found the big sticks in the eighth minute of the third term. Natasha Farrier quickly responded for the Eagles’ first of the game, but the visitors still trailed by 30 points at the final break. By the time the next, and only goal went through – a major to Sarah Perkins in the final quarter – the game was done and dusted. While Norwood’s accuracy could have improved, the Redlegs walked away with their fourth consecutive win to start the season. In terms of individual performers, Redlegs’ Najwa Allen had another day out with 29 disposals, three marks, five tackles and four rebounds, while Hannah Priest had 22 touches, three marks and four tackles. Sophie Armitstead laid six tackles from her 15 diposals, while Leah Cutting had 19 hitouts and laid eight tackles in the victory. For Woodville-West Torrens, Jovanka Zecevic had a team-high 17 disposals and six rebounds, while Kiana Lee was productive despite not hitting the scoreboard with a major, finishing with 14 disposals, six marks (two contested), three tackles and two rebounds. Next round, Norwood looks to continue its undefeated streak against West Adelaide in the middle game of a triple header at Coopers Stadium, while Woodville-West Torrens takes on South Adelaide at Flinders University Stadium. South: Alana Browne, Nicole Campbell, Jess Kirk, Indy Tahau, Mykala Walker-Murphy. North: Kelly Barltrop 2, Cristie Castle, Adrienne Davies, Emma Sampson, Danielle Nunns. South Adelaide produced a massive comeback against North Adelaide to claim the points in a thrilling one-point victory which had everything. The Roosters had the game on their terms early with four first-quarter goals, two of which came from leading goalkicker Kelly Barltrop, while Danielle Nunns and Emma Sampson also added majors in the term for the Redlegs to race to a 25-point advantage at quarter time. A shell-shocked Panthers outfit reset at the break and hit back, but it took a while to find their radar as missed opportunities would have had fans starting to question whether they would regret their inaccuracy later on. Three consecutive behinds to the Panthers were made all the worse when Adrienne Davies sent one through the middle to make the Roosters lead 29 points in the tenth minute. A few minutes later, Indy Tahau finally responded for the Panthers, but by the main break they still trailed by 21 points. Slowly bit by bit they chipped away at the margin with the home side keeping the Roosters scoreless in the third term while Mykala Walker-Murphy and Jess Kirk added their names to the scorers list. It was eight points at the final break and when Alana Browne found her range, the Panthers trailed by the barest of margins. Starting to get nervous, the Roosters fans were reassured somewhat when Cristie Castle scored a goal in the eighth minute – their first, and only – score of the second half. Walker-Murphy missed an opportunity a few minutes later, and a crucial rushed behind made the difference less than a kick. Nicole Campbell then became the Panthers’ saviour with a goal in the seventeenth minute to hand her side the win. Upon returning to the Panthers’ side, Nikki Gore was her usual productive self with 24 disposals, two marks, four inside 50s and five tackles, while Czenya Cavouras continued her good form with 17 disposals and two tackles. While she missed finishing with a couple of goals, Hannah Munyard was impressive with 16 disposals, four tackles, two inside 50s and two behinds, while match winner Campbell, and teenagers Teah Charlton and Montana McKinnon all had 14 disposals. McKinnon again looked strong in the ruck and around the ground with 20 hitouts, four inside 50s and four contested marks. Charlton had five inside 50s and laid a team-high nine tackles. For the Roosters, Amber Ward was massive in defence with 11 rebounds to go with 15 touches, two marks and eight tackles, while Sarah Ellis and Rheanne Lugg also recorded 15 disposals. In Round 5, South Adelaide host Woodville-West Torrens in a bid to keep in touch with ladder leaders, Norwood, while North Adelaide face Central District with the Bulldogs on a two-game winning streak. West: Alexandra Mason, Emma Smith. From one high scoring thriller to a low-scoring affair, West Adelaide got the chocolates against Glenelg with just two goals from six scoring shots in the entire game. The first quarter involved just one rushed behind, with the Tigers taking the narrow lead, until the fourteenth minute of the second quarter when Emma Smith converted an opportunity for the Bloods. They entered the main break with a six-point lead, and when Glenelg missed an early opportunity in the third, it was beginning to become clear goals were hard to come by. 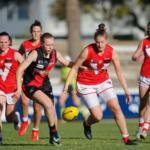 Celestina Dona also missed a chance midway through the third term, and it would not be until Alexandra Mason put one through just 96 seconds into the fourth for West Adelaide to have a meaningful lead. The Bloods led by 10 points and despite being plenty of time left on the clock, much like the rest of the game, neither team could manage a score and the Westies ran out 2.1 (13) to 0.3 (3) victors. Rebecca Owen was the only player with more than 20 touches, finishing the game with 21 disposals, three marks (one contested), three tackles, three inside 50s and three rebounds. Abbie Ballard (17 disposals, eight tackles) and Madison Newman (16 disposals and eight rebounds) were impressive once again, while Tekira Hoffmann had 19 hitouts roaming through the ruck. Team leading goalkicker, Chelsea Biddell did not register a score, but assisted in the ruck with seven hitouts as well as four inside 50s and two contested marks. For the Tigers, Caitlin Gould had 14 disposals, five marks (two contested), 24 hitouts, six inside 50s, five tackles and three rebounds to be the standout tall on the ground. Other Glenelg players who managed to have an impact included Lucy Armitage (11 disposals, eight tackles), Samantha Franson (11 disposals, seven tackles and four inside 50s) and Lucy Bellinger (11 disposals, four marks). Next round, West Adelaide takes on Norwood in the competition’s biggest challenge, while Glenelg tries to bounce back from its first loss with a match against the winless Sturt. Central: Katelyn Rosenzweig 2, Jessica Sedunary, Chantel Reynolds, Courtney Jensen. Sturt: Caitlyn Swanson, Kate Harris, Lane Trenorden. Central District made it two consecutive wins in Round 4, handing the winless Sturt yet another defeat with a 16-point victory over the Double Blues. Sturt struggled to score for the majority of the match and while the visitors booted three straight majors in the final term, it was a case of too little, too late. Central District had plenty of opportunities in the first term but missed their chances with two goals from six scoring attempts. Katelyn Rosenzweig converted an early opportunity in the third minute and Chantel Reynolds made it two later in the term. Neither team could seem to find the big sticks in the second term with four behinds resulting in the Bulldogs heading into the main break with a 13-point advantage. Back-to-back goals to Courtney Jensen and Jessica Sedunary to open the third quarter stretched the margin out to 25, and when Rosenzweig scored her second of the match near the end of the quarter, the Bulldogs led by 33 points and had held the Double Blues goalless for three quarters. As if the deficit woke them up, Sturt piled on three goals in the first eight minutes – to Lane Trenorden, Kate Harris and Caitlyn Swanson – to give themselves a sniff, but ultimately it would not be enough as they went down 5.8 (38) to 3.4 (22). Sedunary finished the game with a team-high 17 touches, two marks, four inside 50s, seven tackles and a goal, while Demi Sonneman had 16 disposals, five marks, two tackles and an impressive seven rebounds. Rosenzweig booted 2.4 from 10 disposals, two marks and two tackles, while Latiah Huynh and Shannen Solly both recorded 14 touches. For Sturt, Sophie Hoyle found the ball 23 times and had three marks, five inside 50s, two rebounds and laid four tackles, while Georgia Bevan continued her terrific season with 21 disposals, one mark, four inside 50s and five tackles. Other Double Blues who stood up included Swanson (21 disposals, one mark and four tackles), Maya Rigter (10 disposals, two marks, four inside 50s and two rebounds) and Hannah Dreckow (10 disposals, one mark, 12 hitouts and three tackles). In Round 5, Central District hosts North Adelaide, while Sturt hopes to get on the board with a win against Glenelg after the Tigers suffered their first loss of the season in Round 4.